Back on December 22, the security firm CrowdStrike released a report claiming that a tool used in the DNC hack had also been used — rewritten for Android — in malware that appeared in an application used by Ukrainian artillery units. The report itself purported to show that a hacking tool used in the DNC hack had also been used to kill Ukrainians fighting Russian separatists. This implant represents further advancements in FANCY BEAR’s development of mobile malware for targeted intrusions and extends Russian cyber capabilities to the front lines of the battlefield. But the release of the report — released just a few weeks after President Obama called for a review of the intelligence relating to the DNC hack — was pitched to the press as the piece of evidence that CrowdStrike’s confidence that Russia’s GRU had hacked the DNC was now solid. Two entities hacked the DNC, the first using tools associated with APT 29 (which Crowdstrike believes is FSB), the second using one tool (X-Agent) associated with APT 28 (which Crowdstrike believes is GRU). As I’ve explained, only the GRU attribution matters, because they’re the ones associated with leaking the DNC documents to Wikileaks. Crowdstrike found X-Agent, rewritten for the Android platform, infecting an application used by the Ukrainian military, which is an obvious application for Russia’s military intelligence GRU unit. Since X-Agent was found being used in an operation with obvious Russian military application, which therefore must be GRU, then GRU must be the entity that also hacked the DNC, because it used a common tool. CrowdStrike’s founder, Dmitri Alperovitch, told PBS that this amounted to DNA tying Russia to both the DNC hack and the Ukrainian artillery app. Essentially the DNA of this malicious code that matches to the DNA that we saw at the DNC. Two other entities (including an anti-Russian Ukrainian hacker) have gotten access to X-Agent — the tool in question — meaning that any use of it by GRU in one application cannot be said to be proof its use in another application means it was GRU. The hacking of the artillery app probably couldn’t have had the complete functionality or the effect (devastating Ukrainian artillery units) CrowdStrike says it had. The second point is interesting. 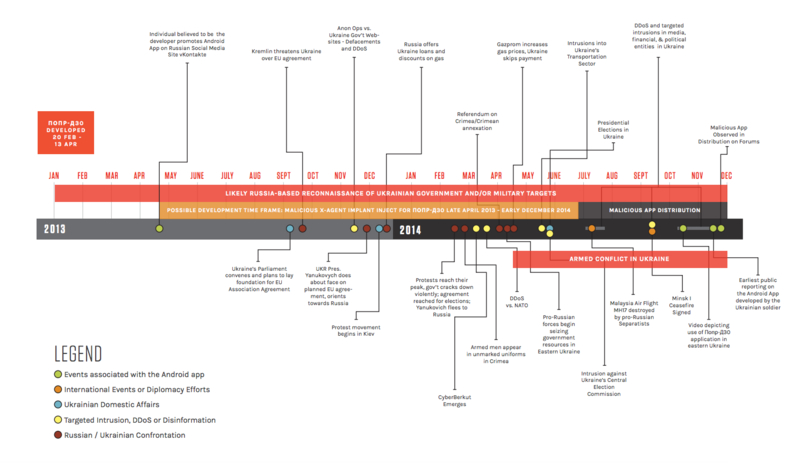 I’d add that the timeline CrowdStrike develops to explain how Russian malware would end up in a Ukrainian artillery app by December 2014, in time to play a part in devastating losses, has some problems, notably that it assumes GRU was developing a tailored app to target Ukrainian soldiers more than six months before Viktor Yanukovich’s ouster, at a time when a Russian-Ukrainian war was unforeseen. Why would Russia start developing an app to kill Ukrainian soldiers at a time when they were still led by someone who was a Russian client? That development timetable appears to be dictated by the necessity of arguing that huge artillery losses that took place in July and August 2014 were due in part to this malware. None of that is fatal to CrowdStrike’s argument that the malware infecting the Ukrainian artillery app was put there by Russia. I actually think that quite likely, though think CrowdStrike’s various explanations for it are unpersuasive. Therefore, the implant likely targeted military artillery units operating against pro-Russian separatists in Eastern Ukraine. At the time of this writing, it is unclear to what degree and for how long this specific application was utilized by the entirety of the Ukrainian Artillery Forces. While Carr’s piece is not fatal to the argument that the X-Agent in the Ukrainian artillery app came from GRU, it does highlight how one person, in less than two weeks, could have found answers to some of things that CrowdStrike still hadn’t even tried to answer (say, by interviewing the application developer) at least six months after they started looking into this malware. More importantly, the first point Carr makes — that others have access to X-Agent — is very important. He notes that the anti-Russian hacker Sean Townsend not only knows that it could be used by others, but that it has been. In fact, Sean Townsend believes that the Russian security services DO use it but he also knows that they aren’t the only ones. That doesn’t mean that GRU wasn’t the entity using X-Agent in the DNC server last year. It just means it is not, as CrowdStrike has always claimed, definitive proof that it had to be. If multiple people have access to X-Agent, the Ukrainian app, with its clear Russian military function, may be Russia while the DNC hack may be someone else. I’ll come back to that point later, but for the moment I want to look at how CrowdStrike came to release a speculative report tying the malware in the DNC servers to dead Ukrainians on December 22, less than two weeks after Obama called for a review of the intelligence on the hack. I asked Alperovitch some questions about the genesis of the report on Twitter. Alperovitch revealed that no one had paid for this report: CrowdStrike was apparently doing this work for free (!!). They found the X-Agent malware in the artillery app because they had set out to look for X-Agent implants. But when I asked about timing and/or where they found it, he got less responsive. Indeed, the timing of these discoveries is something the report itself is sort of funny about. In late June and August 2016, CrowdStrike Intelligence provided initial reporting and technical analysis of a variant of the FANCY BEAR implant X-Agent that targeted the Android mobile platform2. Barring more clarification on whether they started looking for X-Agents before or after they very publicly accused GRU of hacking the DNC in June, what appears to have happened is this: CrowdStrike found the X-Agent in the DNC servers, accused GRU of doing the hack, and then set out — on their own dime — to find more instances of X-Agent deployment. They did not, however, do basic research (like calling the developer of the Android app, Jaroslav Sherstuk) to confirm their speculative conclusions about it, not over six months time. Having not done that research, however, they released a report claiming they now had high confidence in their earlier attribution at precisely the time when it would affect the debate about whether GRU really did this hack or not. Again, none of this means CrowdStrike was wrong about GRU hacking the DNC last spring. Just that this report — the timing of which is as interesting as the speculative claims — should not be regarded as providing the high confidence it claims. Excellent deductive logic, “(like calling the developer)”. The questions raised in this article with embedded Tweets again pause and then syncopate the rhythms being put forth from official sources. Keep the music coming. So who are we going to trust Alperovitch or ..(just about anyone else)? The famous controversy, regarding the number of Angels whose dancing could be accommodated on the head of a pin, is beginning to look substantive by comparison with the ongoing saga of the number of angles that can be discovered in the investigation of a hack that never took place. On the other hand, since the democratic Party seems intent on committing suicide, by sacrificing the last tiny remains of the shreds of credibility which survived the past eight years, it may be important to return to the story of the DNC and Podesta e-mails. Who knows? Their content might be critiqued one day? @bevin, is emptywheel biased against the DNC and/or corporate democrats? This site seems highly critical of democrats. Not that that’s wrong or anything (given their treatment of sanders) but Im curious about it. Listen, I do not know who you are, and, honestly, I do not give a damn. But you are violating our terms by blatantly sock puppeting. You can stop that right now or be banned in the future. The choice is yours. For the record, this “Jillary Stein” is the exact same “commenter” as “Billary Clinton” earlier. Don’t be idiots, and don’t be sock puppet dicks. Hi… i am also curious to the answer. Alperovitch revealed that no one had paid for this report: CrowdStrike was apparently doing this work for free (!!). First, it’s good advertising. Having original research published into the security community shows that we actually do stuff, and not just sit around at our desks. It gets our names out there and helps us get contracts and business contacts. This benefits us in the long run. Second, it’s done as a service to the community as a whole. There are many organizations – NGOs, nonprofits, small companies and startups, just to name a few – which don’t have the access, connections, time, or security teams big enough to monitor global news, social media, and OSINT channels to keep a sense of active threats. What is commonly done is tasking one person with monitoring the blogs of multiple security companies. This helps the orgs in general (and security practitioners in particular) know what to tune their security systems to look for (and usually search for and close off any relevant security vulnerabilities they have now). Third, the information security community as a whole (no, I’m not saying ‘cyber’, that makes us sound like a bad 90’s hacksploitation movie (but I repeat myself)) circulates information about attacks, vulnerabilities, best practices, intel, et cetera within itself, and has for many years because we’re all in this together. We might not have the same clients and business partners, but we’re all tasked with trying to make everybody more secure in the short, medium, and long term. We might seem like a bunch of weirdos, but we’re all passionate about security in all its forms. We hang together or we all hang separately (for some definition of ‘hang separately’). I’m aware of all of those things. However, in such cases, the end product is usually … an end product. Not here. This is far more than a signature — “hey, look, X-Agent comes in an Android version and here’s how you can check for it” (which may be what the private product earlier stuff consisted of) but not yet a larger causal explanation “hey, that X-Agent took out 80% of Ukraine’s artillery units, it proves Russia hacked the DNC.” Even the latter would be welcome if it consisted of finished research. That’s why not doing the due diligence (like calling the developer here) is so important. Because the middle work of the report is still speculation that, given the timing, invites questions. Says one while contemplating the end of winter and planting seeds of her favorite various garden denizens , of which will make spouse pleasing delights. Must be a tough balance. 1) Warburg Pincus. Tim Geithner, is president of Warburg Pincus, former Secretary of Treasury under Obama, and formerly worked in the Clinton administration … Uh-oh. Warburg Pincus was a contributor to the DNC and Clinton campaign. 3) And the last funder of CrowdStrike is Google Capital ($100m in 2015), now CapitalG, managed under David Drummond of Google who was instrumental in ‘realigning’ Google search engines to favor Hillary’s campaign. Former first daughter Chelsea Clinton and Accel partner Sonali De Rycker have both joined the board of IAC/InterActiveCorp, the company announced in an SEC filing [Eff. Sept. 22, 2011]. The two will join IAC’s 14-member board which includes IAC chief Barry Diller and former Disney CEO Michael Eisner. According to the Clinton Foundation website, Accel is a venture capitalist partner in the Endeavor Investor Network [Board members that include eBay founder Pierre Omidyar of Ukrainian Maidan infamy]. The Russians Are Coming! The Russians Are — Oops! No Russians! Russia Hacked the DNC. But What, Specifically, Did GRU Do?